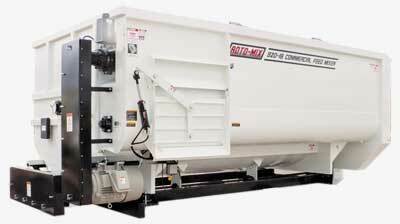 The 720-16 Horizontal Rotary feed mixer has a mixing capacity of 720 cu. ft. and can hold a maximum load with a heavy ration up to 20,500 lbs. It is available with a choice of several rotor styles to better mix your specific kind of rations. The patented Staggered Rotor GeneRation II option is ideal for feeding rations that require wet distillers grains. Three, five and six-Bar option rotary mixers allow more leaves and particle length during mixing with hay. 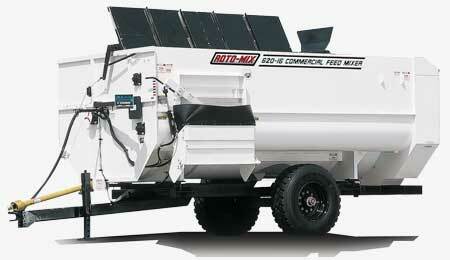 These Roto-Mix Commercial Series feed mixers are ideal for large-sized feeder or dairy operations. The patented rotor lifts feed up to the side augers that move the feed from end-to-end for thorough mixing. 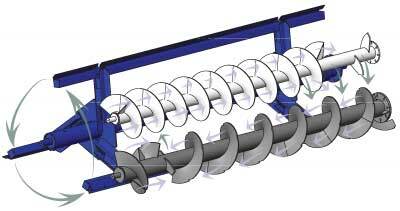 The lifting action of the rotor eliminates wedging of the hay or long cut feeds under the lower auger. Patented tumbling design reduces mixing power requirements. See more about rotor options below. Our thorough mixing action eliminates dead spots and corner pile-up, giving you a consistent balance of nutrients from the first pound of feed to the last. Complete mixing of ingredients also reduces the ability of the cattle to sort and “nose out” ingredients. 3/4", 5/8" and 1/2" flighting available for lower auger to extend life. Top augers available in 3/8" and 1/2" flighting. Load cell mounting comes standard with Roto-Mix ball and socket type tie bars to connect the mixer to the frame. This feature eliminates side and end movement on the load cells which allow for scale dependability and accuracy. Allows quick lubrication from a single point. Heavy-duty drive assembly runs in an enclosed oil bath. A lower center of gravity makes for a more stable unit when feeding and less shock load when cornering. The flared side allows feed to tumble out of the rotor speeding up the mixing action and reducing the chance for feed to get trapped inside the rotor. 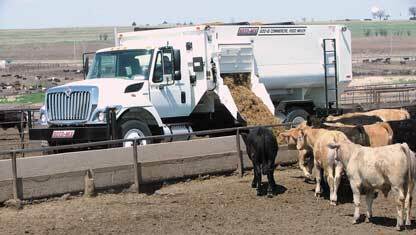 Feeds all types of grain, liquid feed, by-products, and forages. Ability to mix small and large batches with consistency, day after day, even with micro ingredients. Splined shafts eliminate shearing of keys and gaulding of shafts. Heavy-duty chains and bearings extend life and reduce downtime. Adding hay to the ration is easy and convenient. Place the hay in the Hay Processor on the unit and let it do the work of separating the hay and distributing the long stemmed material into your mix. The result is hay with leaves intact and the stem not continually cut up or crushed. Helps to hold the hay in the processor to be separated and eliminates “hay balls” from slipping in-between the flights and into the mixing chamber. 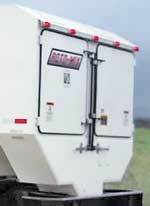 Door—Wide door openings allow for fast feed delivery with easy hydraulic control while mixer is running. Spouts—Gravity discharge spouts have no moving parts. 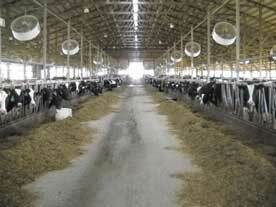 Wind exposure is reduced compared to other units throwing feed to the cattle. Magnets—Trap foreign metal before it reaches the feed bunk. 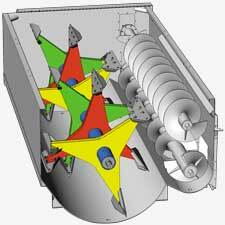 Rotor options of 3, 5, 6 or staggered to match the ration density and improve mixing speed and performance. Which Style Rotor Should I Choose? 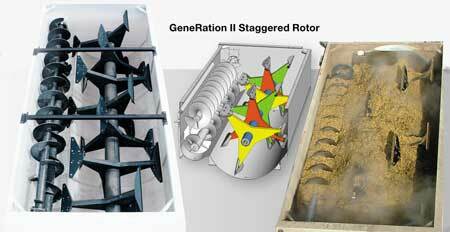 GeneRation II Staggered Rotor option is ideal for feeding rations that require wet distillers grains. Improved lifting and tumbling action, less revolutions, faster mix saves time and fuel and lowers maintenance costs. 5-Bar option allows for more leaves and more flakes. The patented rotor lifts feed up to the side augers that move feed from end to end for thorough mixing. This option is preferred in beef operations not using wet distillers grains. 3-Bar option Rotary Mixer allows more leaves and particle length during mixing with hay— a preference when feeding in dairy operations. ‡ Tire sizes may vary height. Weights listed with most common option packages excluding hay processors and folding conveyors.